Rumours of Creative releasing a new player have been floating around for many months but as the company wasn't able to achieve a decent battery life to support the X-Fi feature on the player (among other teething problems), the release of the player have been delayed time and again. 1. First Creative player to feature its proprietary Xtreme-Fidelity sound technology. The X-Fi Crystalizer intelligently restores details that were lost during compression of audio files while the X-Fi Expand gives audio a realistic and natural feel by moving the sound away from your ears and repositions it in front of you - as if listening to a live performance on stage. X-Fi Expand works best with your earphones or headphones. 2. The in-built Wi-Fi allows you to chat with friends over via Yahoo! and MSN messenger and also play video/audio content off Creative "public media server" or your home server. 3. 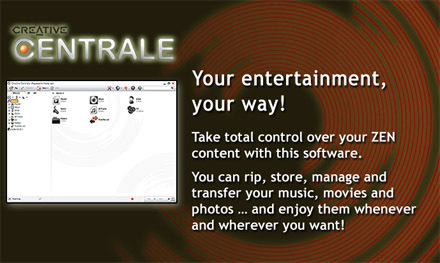 All new Creative Centrale - a better software solution for all your media needs. 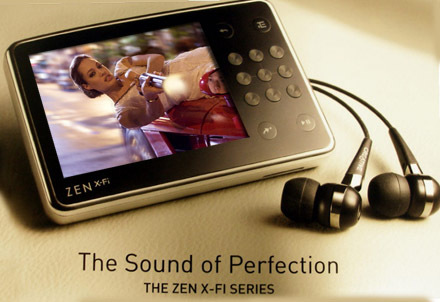 Best of all, it comes with a DVD ripper that helps u rip DVD content for your ZEN. 4. 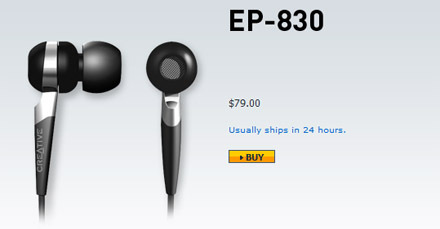 No more cheap bundled earphones for you. The new ZEN X-Fi comes with Creative latest noise cancellation in-ear earphone EP-830 worth $79 for your listening pleasure. 5. Long battery life - although unconfirmed, the ZEN X-Fi would have a longer battery life than the ZEN, which stands at 30 hours for audio and 5 hours for video. 6. Radio, Microphone, SD Card slot and built-in speaker. 7. Available in 8, 16 and 32GB.